…and I’m addicted to flowers. Peonies from The Ton, to be exact. I am so terribly, utterly thrilled to be doing my first post as a Design Team member for The Ton Stamps, and so it took me a few tries to create a card with which I was satisfied. (Perfectionist, much?) Anyway, The Ton’s peony stamps are amongst my favorite stamps… ever…. so I had to create a card marrying my two favorite things: peonies and watercolor. I started with a sheet of my favorite Strathmore cold press watercolor paper and heat embossed the blooms and leaves from Peonies 1, 2, and 3 with gold embossing powder. Peonies are out of season right now, so I wanted to come up with a color scheme that was a bit more seasonally appropriate than my typical pink peonies. (Oh, is there anything lovelier than a pink peony?) I decided on a red, black, and white color scheme with touches of gold, and so used my Zig Clean Color markers and Distress Inks in various shades of red and pink to watercolor my flowers. After they and the leaves were dry, I fussy cut them out and went to work on the background. I wanted something relatively simple for the background, so as not to detract from the flowers, and so I grabbed the Polka Dot background… that thing is awesome. I hate having to try to line up dinky little polka dot stamps to cover my card front, and this massive 6×6 stamp makes life simpler. Anyway, I stamped the full stamp on some 6×6 card stock so that I could trim the sides down to the optimal size. For the sentiment, I took a strip of black card stock and heat embossed the sentiment (from Large Peony 3) in gold, then trimmed it down and cut flags on the ends. Tip: if you’re using an anti-static powder tool on black card stock, use a regular white pencil eraser after heat embossing to remove that unsightly white halo of powder. 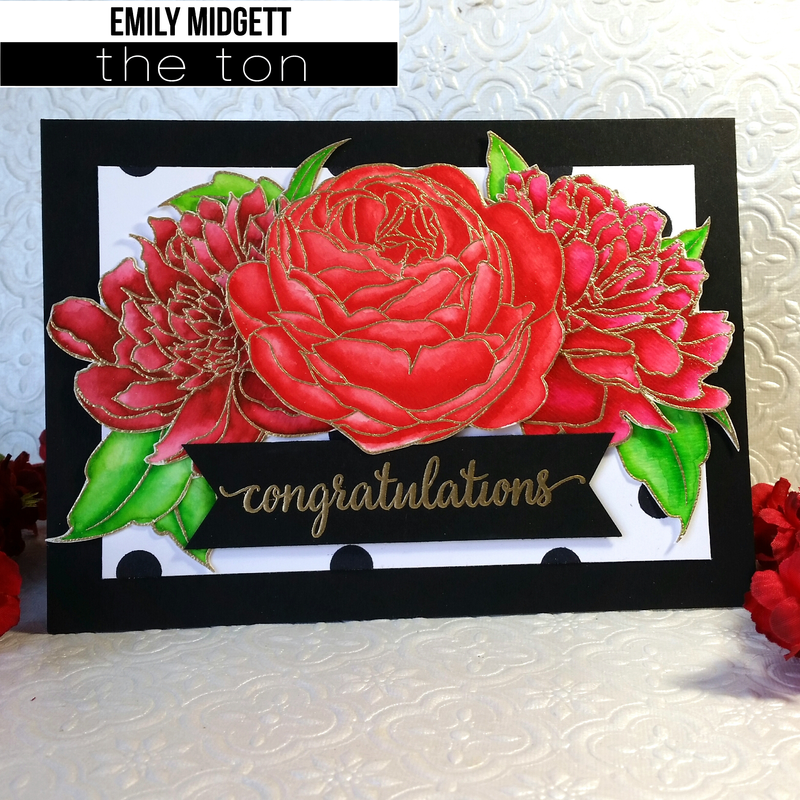 The large scale of these fabulous blooms lend themselves well to large cards; in this case, I was able to create a 5×7 card. I arranged the blooms in a sort of swag on the polka dot panel, popping up the middle bloom to add some dimension. I adhered everything onto a black card base. I think I might be giving this one to my cousin for her wedding… These large cards are great for truly special occasions, and the wedding of my bff is a perfect excuse for this super-sized card! I hope you have enjoyed my first post! I am so very excited and honored to be here amongst such talented ladies. Have a fabulous week, friends! Emily, your card is fabulous and has great wow factor. Your friend is going to love this card. Amazingly beautiful card, I love it! Beautiful card Emily! What medium do you use to emboss on watercolor or multi-media papers? I have trouble getting the powders to stick. The versamark seems to absorb into these papers. So I just get spots of adhesion of the embossing powders. Thank you, Amy! I have only ever tried Versamark ink for use with my embossing powders. I’ve found that a juicier pad helps things, so perhaps your pad is dry? Watercolor paper with lots of texture also makes it a bit more challenging to get a really good impression. My favorite paper for watercolor is the Strathmore 500 series cold press. It’s great for embossing most images, with the exception of large solid images. I’ve found an anti-static tool and a really juicy Versamark pad to be essential. I hope that helps! Emily! This is another breathtaking beauty! Your cards using the Large peonies are better than a fresh bouquet…they will last for years!! Gorgeous card Emily!! I I love your color scheme and have these stamps now on my wish list . *swoon* Absolutely gorgeous card! Your watercoloring couldn’t be more perfect! This is such a brilliant first post. Wonderful eye catching card, I cant wait to see more. Well u obviously have a lot to contribute, Emily! Love this card and I also love peonies. I’m trying to decide which stamps to buy! And now the new release! Ah! Thx for the inspiration!